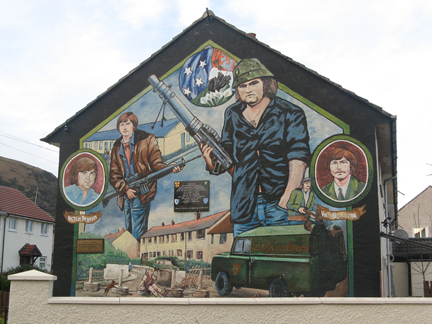 The mural (right) is found in the Ballymurphy district of Belfast. This and other similar murals across Belfast valorize armed combat, in this case the heroism of I.R.A. volunteers. 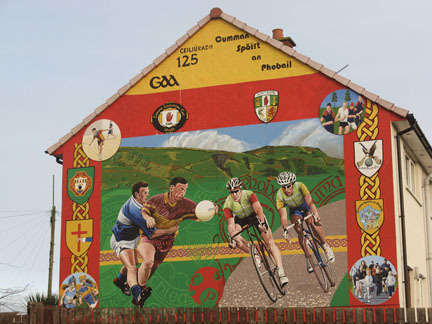 Just a few blocks away, another mural (below left) by the Gaelic Athletics Association, displays contemporary sports, both Gaelic and non-Gaelic. “Sports have played an important part in the development of Irish nationalist identity,” says Lee Smithey, assistant professor of sociology and peace and conflict studies, whose research interests include peace and conflict, social movements, conflict transformation, and nonviolent conflict, particularly in Northern Ireland. This year, Smithey and colleague Gregory Maney, associate professor of sociology and co-director of the Irish Studies Program at Hofstra University, have been conducting a Mural Mapping Project, using geographic information systems technology, to conduct analyses of the geographic, temporal, and content distribution of murals and other semi-permanent ethnic and political displays—such as memorial gardens, monuments, or sculptures—in Northern Ireland. Student participants in the College’s Semester in Northern Ireland Program, including Samia Abbass ’11 in the fall and Devon Novotnak ’11 this spring, assist on the project. 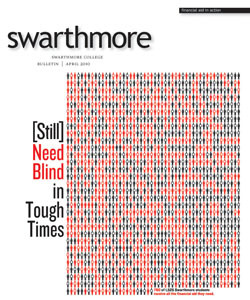 “Precisely locating murals, we will count them, but we will also study their changing proximities to thoroughfares, commercial centers, interfaces where Protestant and Catholic neighborhoods meet, and other important features of the social terrain, such as distributions of political violence, wealth, poverty, and participation in politics,” Smithey says. “By following the way in which murals have been removed, replaced, or redesigned over time, we can track their development alongside changing political, cultural, and social backdrops, especially with regard to the political peace process and community-level voluntary action.” Smithey and Maney hypothesize that although armed conflict remains part of the West Belfast landscape, Republicans and Loyalists are increasingly emphasizing other themes (such as sports) as part of the peace process, both reflecting and shaping collective identities. Smithey and Maney hope to involve local community organizations and civil service agencies in the research to ensure that the results can be of benefit to community development and community relations initiatives. “We have begun a pilot project in West Belfast, including both Protestant and Catholic areas, with more than 1,500 photographs on hand to date—a collection that will grow as we conduct further field research and begin our content, spatial, and temporal analysis,” Smithey says. The project is sponsored in part by the Hungerford Fund, a provost’s discretionary fund established by Eugene Lang ’38 two years ago to enable special grants to individual faculty members in support of particular professional projects.